The centralised deployment functions of a retail digital signage solution allow a signage network to be managed from a single PC. 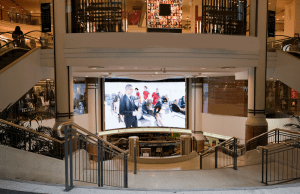 From advertising new products to relaying weather and traffic alerts to customers in store, a retail digital signage solution from us at Signbox Microsystems is a dynamic and cost-effective way to get your message across. The centralised deployment functions of a retail digital signage solution allow a signage network to be managed from a single PC. Whether you want the same information to go to every screen, or you want to tailor messages specifically to one outlet, we can accommodate your requirements. Display a severe weather alert or an important breaking news story, as and when they happen. A Signbox system can capture data and update displays in real time, keeping customers informed of the things that matter. See our signModules such as signWeather which can help to implement this. The powerful marketing potential of a retail digital signage system allows you to sell advertising time and space for brand promotions, or to anyone who wants to exploit the vast marketing potential offered by digital display screens.